It doesn’t matter whether you’re 15 or 55; no one likes hearing that they need braces. Traditionally, braces are thought of as ugly, uncomfortable metal contraptions. But these days, braces technology has improved considerably and they are nothing like the eyesores they used to be. There are myriad options available, and plenty of different braces colours on the market. Unfortunately though, they are still a visible form of orthodontic treatment – with Invisalign being the best option if you’d prefer to hide your braces as much as possible. If you want to keep your braces as invisible as possible, you can go with the ceramic option. Ceramic braces are exactly the same as metal braces except they use clear or tooth-coloured wire that match the colour of your teeth. These braces function in exactly the same way, but they are more expensive than traditional wire braces. They also stain easily; especially if your dental health regime is less than perfect. Invsalign braces are a popular option for those people who want a less-noticeable option. Invisalign is made out of clear plastic, which makes it nearly invisible. Typical steel braces have silver-coloured brackets. These brackets are a far more affordable option than ceramic braces. 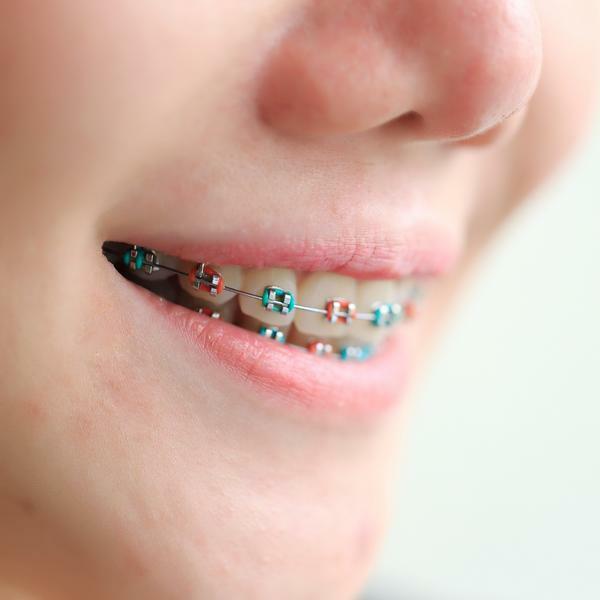 You also get to add a visual element to your braces by using coloured elastics. The elastics are changed every four to six weeks, meaning you can change your colour or colour combination every month or so. There are plenty of colours to choose from and you can even choose a different colour for each individual tooth. Choosing colours for your braces is obviously a very personal decision. There are no hard and fast rules. Like the clothes you wear, it’s all about finding what works best for you, and what makes you feel good. Skin Tone: The tone and shade of your skin informs a lot of the choices we make. It helps us to choose hair colour and the colour of clothes. It can also help us with the colour of our braces. Orange, green, gold, dark blues and gold work well with darker skin tones, while purples, light blues and less intense shades of pink and red work well with lighter shades of skin. Work With Your Teeth: You should keep in mind that darker coloured elastic will help your teeth to appear whiter. On the other hand, lighter coloured elastics can make your teeth appear yellow. If you’ve ever put zinc on your lips and then looked at your teeth in the mirror you’ll understand the difference we’re talking about. If you’re blessed with pearly-whites then go for the darker option, if your teeth are a bit stained it may be better to stick to the lighter colours. Don’t Forget Your Eyes: We don’t only smile with our mouth; our eyes are an incredibly important part of a smile. With that in mind, it’s important that you choose a colour that compliments or matches your eyes. That means blues with blue, dark colours with browns and green with hazel. Show Your Passion: Australian’s love their sport and coloured braces give you the opportunity to show your loyalty every time you smile. No matter what code you follow, you can find the colours you want – brown and gold for the Hawks fanatics, blue and white for the Victory and purple and black for the Storm. This is a great way to get the kids more comfortable with the idea of braces. Get Festive: Festoon your teeth with a bit of red and green to get into the Christmas spirit, or perhaps red to celebrate Valentine’s Day. Something Fun for the Kids: These days, you can even get glow-in-the-dark braces. These are completely clear during the day, but watch your child’s joy when his or her smile lights up a dark room at night. Grillz: If you don’t know what Grillz are jump online and type it in. If you do, you’ll be pleased to know that you can re-create the look by using gold and silver elastics. Grillz are no longer the sole domain of hip-hop artist, everyone from Madonna to Miley Cyrus has been blinging up their smile – why not give it a go for something a little more outrageous? If you’re absolutely desperate to have black elastic then we certainly won’t stop you. Just keep in mind that from a distance, black elastics (or even green) can give off the appearance of rotting teeth or food stuck in your teeth. Braces don’t have to be horrible. Modern braces are far less intrusive then they used to be, and if you are prepared to have a bit of fun with colour they will grow on you. For some people, braces are an absolute necessity, so embrace them and colour your smile. For more information on choosing the right braces or colours for your braces please contact the friendly dhealthy Dentistry team today.